Auburn, Calif., June 30, 2016 — The American Red Cross in partnership with El Dorado and Placer counties Office of Emergency Services have established two evacuation shelters for residents who have been affected by the growing Trailhead Fire. There are two shelters available to provide a secure place to stay for both evacuees and their pets. The shelters are separated due to the health and safety of our shelter guests. Red Cross is providing shelter, food, snacks, water and emotional support. This shelter is being staffed by Red Cross volunteers and managed by the El Dorado County Health and Human Services. The County is also providing a small animal pet shelter at this location. All large animals need to be transported to 1100 Cold Springs Road, where El Dorado County Animal Services has arranged for accommodations. The Red Cross is not providing hotel vouchers for evacuated residents, however, we’re encouraging everyone to find comfort at one of our shelters where they can find a safe place to lay down, blankets, food, water and snacks. Disasters like this create more needs than any one organization can meet. The Red Cross works closely with government and community partners to coordinate efforts. A public meeting will be held tonight. Fire staff will give an informational update and answer questions from the public. American Red Cross will be present as well. The Gold Country Region serves a twenty-four county territory including Alpine, Amador, Butte, Calaveras, Colusa, El Dorado, Glenn, Lassen, Modoc, Nevada, Placer, Plumas, Sacramento, San Joaquin, Shasta, Sierra, Siskiyou, Stanislaus, Sutter, Tehama, Trinity, Tuolumne, Yolo, and Yuba counties. For more information, please visit redcross.org/GoldCountry or cruzrojaamericana.org. Stay up to date by following us on Twitter (@RCSierraDelta | @RedCrossNECal) or join the conversation on Facebook’s Sierra-Delta Chapter Page or Northeastern California Page. Trailhead Fire Continues to burn near Foresthill, CA in El Dorado and Placer Counties. Placer County, Calif., June 29, 2016 — At the direction of emergency and fire officials, the American Red Cross is moving the evacuation shelter from Foresthill High School to the Gold Country Fairgrounds in Auburn. The evacuation shelter will be set up at the Sierra Building inside the fairgrounds located at 1273 High Street in Auburn, California 95604. Yesterday, about a dozen evacuees from El Dorado and Placer counties showed up at the Foresthill High School shelter in Foresthill. At this time, it’s critical to follow the instructions provided by local emergency workers. If you are asked to stay in your home, don’t try to leave. If you are not allowed to enter your neighborhood, please come to a Red Cross shelter until conditions are safe for you to return home. The Red Cross encourages those who plan to stay in a Red Cross shelter to bring prescription and emergency medication, extra clothing, pillows, blankets, hygiene supplies, important documents and other comfort items. For more information on what to do before, during and after a wildfire, visit our website: redcross.org. Placer County, Calif., June 28, 2016 —The American Red Cross has opened an evacuation center for residents affected by the ongoing Trail Fire affecting two counties. The evacuation center is located at Foresthill High School located at 23319 Foresthill Road, Foresthill, CA 95631. If evacuation orders remain in place overnight, the Red Cross is prepared to transition to a full shelter operation. Additionally, an Animal Shelter has been set up at the Gold Country Fairgrounds and is ready to receive animals. The Red Cross urges everyone to follow evacuation orders from local law enforcement and have an emergency kit ready go for any disaster including wildfires. We are responding and working together with local emergency services in both counties to offer the best assistance as possible to those who have been asked to evacuate. Visit http://www.redcross.org/prepare/disaster/wildfire to learn more. Placer County, Calif., June 22, 2016 —The American Red Cross has opened an evacuation center for residents affected by the ongoing Trail Fire affecting two counties. The evacuation center is located at Foresthill High School located at 23319 Foresthill Road, Foresthill, CA 95631. If evacuation orders remain in place overnight, the Red Cross is prepared to transition to a full shelter operation. Sacramento, CA (June 28 2016) — Everyone is looking forward to the upcoming Fourth of July holiday weekend and the American Red Cross has steps they can follow to stay safe when enjoying the fireworks or taking a trip to the beach. If you are caught in a rip current, try not to panic. Swim parallel to the shore until you are out of the current. Once you are free, turn and swim toward shore. If you can’t swim to the shore, float or tread water until you are free of the rip current and then head toward shore. The Red Cross and National Swimming Pool Foundation® (NSPF) have developed an online safety course for pool and hot tub owners. Home Pool Essentials helps people understand the risks of pool ownership, how to maintain a safer and cleaner pool, what safety equipment is appropriate, how to prevent pool and hot tub entrapment hazards, and how to respond to an emergency. Members from a fitness group volunteering to help clean a flooded home in West Virginia. Right now, the American Red Cross is responding to two large-scale disasters in the East and West: the raging wildfires in California and the devastating floods in West Virginia. Thanks to people like you, we are there with immediate relief, providing emergency shelter, warm meals and comfort for those who need it most. We’ve already assisted more than 14,000 families who have been impacted by large disasters with casework support in 2016, and with your support, we’ll help even more in the weeks and months ahead. Donate now to Disaster Relief so the Red Cross can continue to provide help and hope in the wake of disasters big and small at a moment’s notice. Nearly every eight minutes, the Red Cross helps a family who has lost everything to a home fire or other disaster. With your support, we can be there once again to make a difference. Red Cross volunteer Joe Smyser hands out cool drinks to firefighters from the Chula Vista Fire Department. Will you make a gift to Red Cross Disaster Relief today so we can continue to be there when disaster strikes? Thank you so much in advance for your support of Disaster Relief. I have the most generous friends. 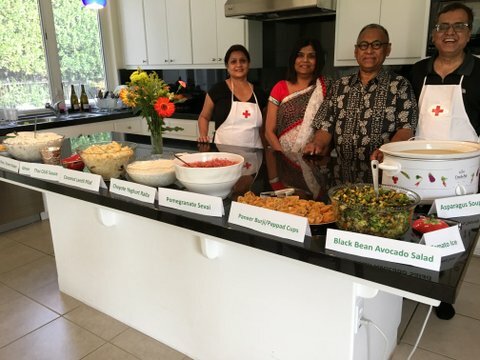 Gita and Sridhar Iyer donated an Indian fusion vegetarian dinner to the Red Cross Bash, which was held last April. 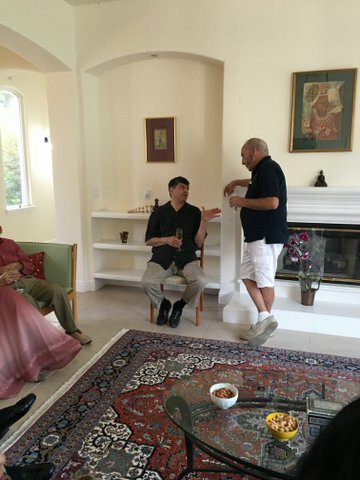 Then, two other friends Hari and Anu Reddi decided to bid on it no matter how much it cost. After a fun auction by David Sobon, the Reddi’s held the highest bid at $2500 for an intimate dinner for eight of their closest friends. 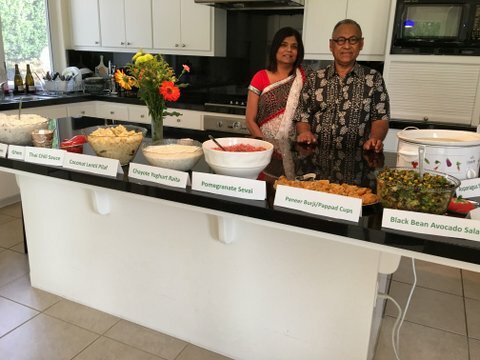 Two months later, the Reddi’s hosted an unforgettable night with amazing food, great company, laughter and joy. They set the tables overlooking the El Macero Golf Course, in Davis. 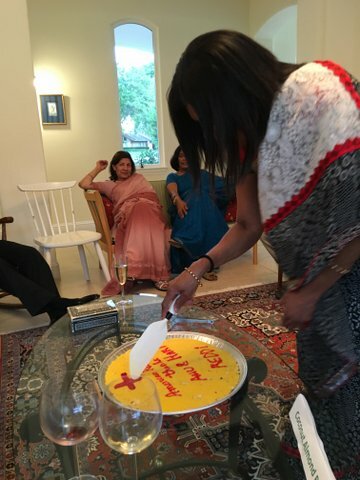 Gita brought her fine china and the Reddis served a different wine with each course. 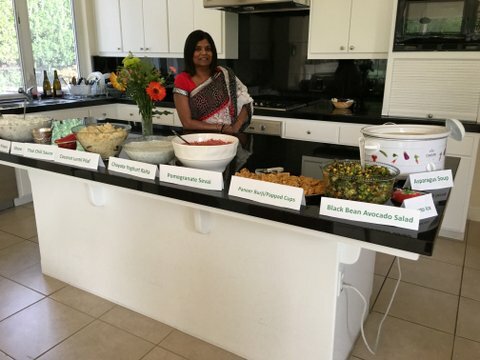 We were served pappadum cups with homemade cheese as an appetizer, followed by avocado and bean salad. 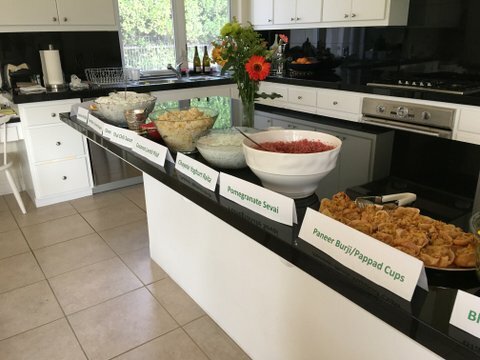 We loved the asparagus soup, the yoghurt rice, the pomegranate rice sticks, which were my favorite. And they closed the amazing five-course dinner with rose ice cream… a perfect finishing touch to an unforgettable meal. 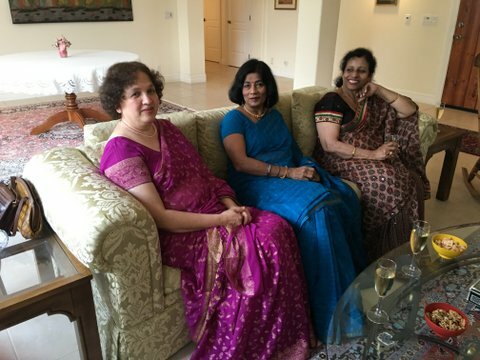 Mohini Jain, another friend of ours , bid on a tour of the airport . I hope that her tour will be equally memorable . Check out the unbelievable, mouth-watering menu we got to enjoy. This would not have been possible without the Red Cross Bash, hope you attend in 2017 and bid on a similar item! 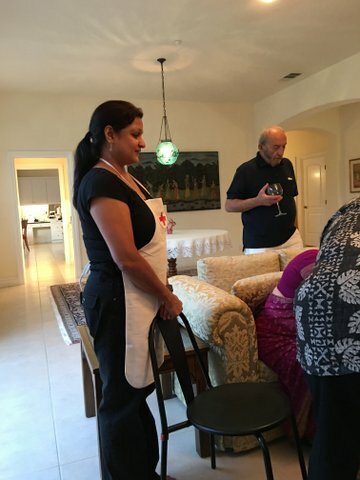 Or if you are a very good cook, you can donate a similar dinner! 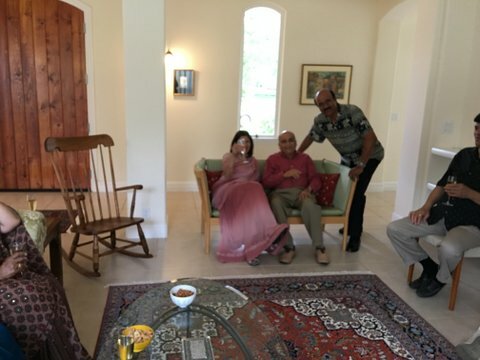 Curried Asparagus Soup – covered by the Press Tribune because the recipe calls for ONE of everything – 1 asparagus bundle, 1 t salt, 1 T butter, 1 spring rosemary, 1 potato, 1 onion. 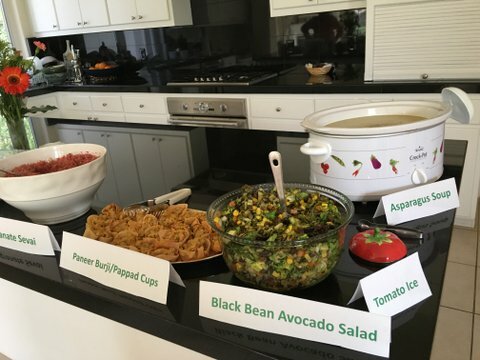 Black Bean & Avocado Salad – cool and refreshing, and ultra-healthy! Toasted pimpkin seeds add to this very colorful, crunchy salad. 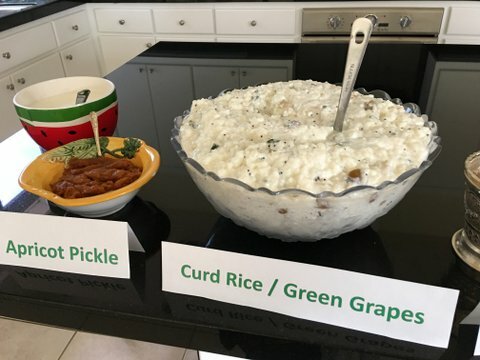 Yoghurt rice – made with homemade yogurt, it was served with chopped green grapes, with a side of Apricot Pickle. Other sides included homemade ghee and homemade yogurt. The lassi that was served between the appetizers and the main course was flavored with organic curry leaves. 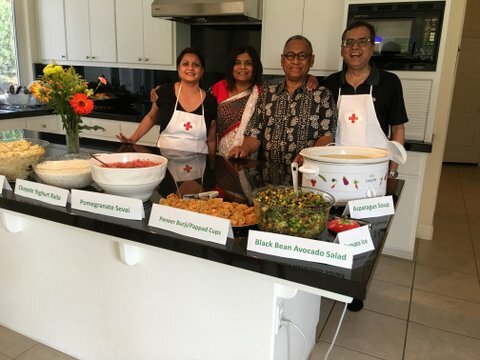 Coconut Almond Burfi tray – The Red Cross thanks Anu and Hari Reddi. With only 3 main ingredients, this burfi can be shaped and decorated you would a cake. I am a career parent, which is to say the last 20 years, of my 40 on earth, have been spent pouring the best parts of myself into 4 wonderful humans. As the first of the 4 developed her wings and left for college; I was realizing the magnitude of being transplanted from one thing to another. For half my life, I have given. Time. Care. Hugs. Compassion. Kindness. Patience. As one by one my children will surely fly the coop; Even surer, is my capacity to give. As a public affairs volunteer, Red Cross allows me the opportunity to listen. In every story I tell, I find my own. In relating the details, I find the courage and heart each individual, or volunteer possess. I add it to my own ever growing heart. Volunteering at Red Cross ,may be holding space for a stranger, or your neighbor, but it is also holding space for yourself. 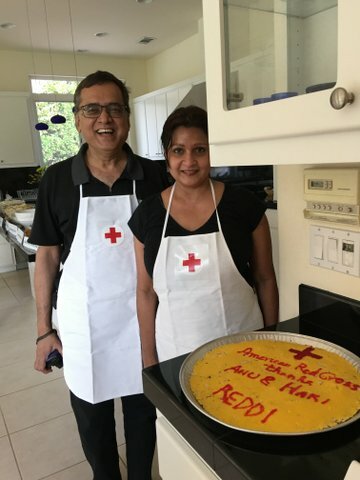 Red Cross needs volunteers to pour life into humanity. Volunteers, like me, need Red Cross to pour meaning into the words I write; or significance into the photos I capture. It builds a bridge over the gap the changes in my own life have created. It allows me to witness, first hand, the best parts of humanity. It also connects me to other people who share the same idea; that giving of yourself with time, resource or compassion fills spaces that expand on who we are. It allows me to give to something larger than myself, while developing new friendships and bonds. Red Cross grants me a platform in which to reflect a little bit of myself onto those who need it. Sometimes it’s your neighbor, sometimes a stranger. Or even your own family. Be a mirror. With a smile. A hug. A meal. Your time. The Red Cross reminds me, much like parenting does, you get back far more than what you put in.